The Dean and Head of UKZN’s School of Law, Professor Managay Reddi and Mr Ntokozo Qwabe at the recent launch of the UKZN Student Law Review Journal which he co-founded. Final year Law student Mr Ntokozo Qwabe is the only scholar in Kwazulu-Natal to receive the Rhodes Scholarship to further his studies at England’s Oxford University. 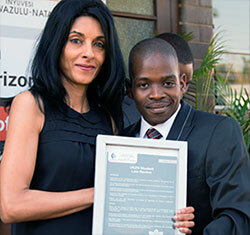 The KZN Rhodes scholarship which is awarded to intellectually gifted and motivated young people with a genuine commitment to serve their societies, a passion that drives Qwabe to rise above adversity and achieve academic excellence. Qwabe’s long-term goals include practicing as an Advocate in Public Law, and ultimately following in the footsteps of his role model, the late former Chief Justice Pius Langa, and becoming a Justice at the Constitutional Court. His immediate academic plans include utilising his scholarship which is for two years to pursue two taught Masters Degrees. For his first year, he will study towards a BCL in Public Law and explore courses such as Comparative Public Law, Comparative Human Rights Law, International Economic Law and a course in Jurisprudence and Political Theory. In the second year, he plans to pursue a different area than law, an Msc in Global Governance and Diplomacy. Before going off to Oxford in September next year, Mr. Qwabe will do his articles as a Candidate Attorney at the number one law firm in South Africa, Webber Wentzel. He hopes that his story inspires others to rise above their own challenges and reach for their dreams.